Elinor Barker says the presence of Sir Bradley Wiggins in the Great Britain squad has given a boost ahead of the European Track Cycling Championships. Tour de France winner and four-time Olympic gold medallist Wiggins, 35, has returned to the track in a bid to win a place at the 2016 Olympic Games in Rio. The Euro Championships are in Grenchen, Switzerland, on 14-18 October. 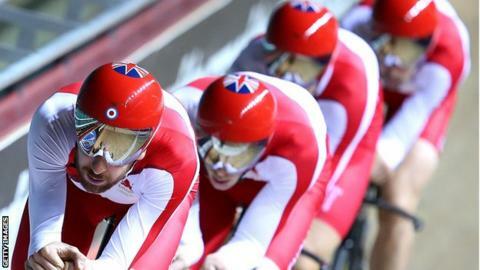 "It's a little bit surreal seeing him in the gym and seeing him around the track," said Welsh cyclist Barker. "But the men's squad training with him all the time, you can tell the difference that it's making to them. "We've got a really strong group and everyone is coming into their own at the moment, and hitting the kind of efforts that we need to be hitting at this point in time. It's going really well." Barker, who is a World and European champion on the track, is one of a four-strong Welsh contingent in the GB squad, along with Ciara Horne, Lewis Oliva, Owain Doull. But Becky James is rested as she continues her comeback following a long-term knee injury.